Brother 1816 is sans serif typeface created by Ignacio Corbo together with Fernando Díaz and published by TipoType which comes in two widths (Normal & Printed) each with 8 weights (from Thin to Black) and their italics. It is a mix between geometric shapes and humanistic strokes. It can choose different types of edges, alternate letter-forms and decorative swashes. With over 450 characters per weights, this flexible font covers more than 150 Latin languages. It has a web version with hinting which allows it to render well in small sizes on screen. Also it merge well on editorial purpose, branding, packaging, web, poster, headline, logotype and so on. Have fun! Price: starting from $19 for one font to $249 for all 32 fonts. 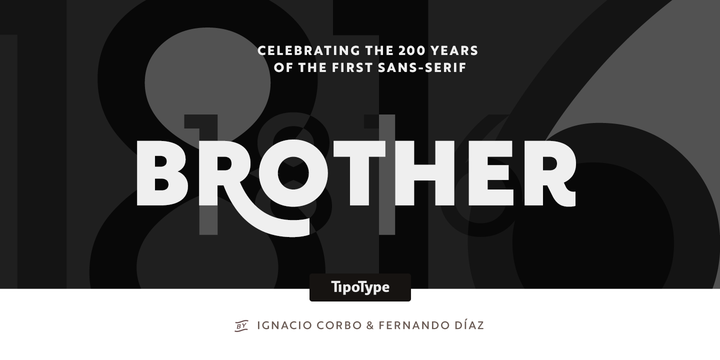 A font description published on Friday, January 27th, 2017 in Fernando Diaz, Fonts, Ignacio Corbo, TipoType by Alexandra that has 5,068 views.